The elegant, contemporary design offers a beautiful look for any space in your home and creates a little pocket of comfort that your dog can call their own. Created from fair trade and eco-friendly practices, this bed truly caters to the animal lovers’ sense of responsible consumerism and provides impeccable quality for your pet. The ultra-bolstered sides of this piece serve as a lovely place for your dog to rest their head — like a deluxe pillow. Meanwhile, the genuine leather handle allows for easy movement and adds a charming detail to the clean, sophisticated aesthetic. 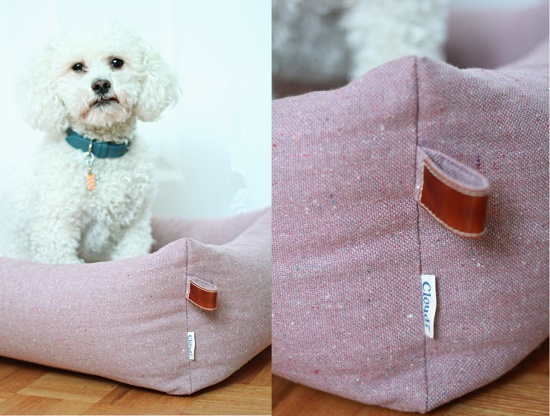 The mattress is specially designed to suit a dog’s physical sleeping pattern and the hemp-cotton mix cover is completely removable and machine washable! So even if pup pounces on this bed with mucky paws, it can easily be restored to pristine condition! I have been living with this particular dog bed for a few weeks now and have been very impressed. From the moment Rory’s wet little nose discovered this bed amidst the bundle of packaging in which it arrived, she has been intrigued! I purposely used this opportunity to train young Rory not to sleep on my bed anymore and to my delight the luxurious feel of the Sleepy Deluxe Tweed Rose made it an easy, almost effortless, transition. Without any encouragement at all, Rory flops down into her Sleep Deluxe Tweed Rose at night without any fuss and delights in squirming around in it to ‘nest.’ I keep the bedroom door closed during the day and when it is finally opened, Rory dashes straight for her bed, delighted to be able to hang out in it. (This has never happened before with any other dog bed we’ve tested to date). The fabric is very durable and soft to the touch and the cushions keep their shape even after being sat upon for several hours. We love these beds too! And so do our dogs! How does the cover hold up after the wash? Also is it stain resistant? Thanks! The fabric is very durable! Excellent for muddy paws!